The Taurus fascia / massage roller Basic allows a comfortable and easy use for self massage for fascia training. The Taurus fascia / massage roller Basic is especially recommendable for beginners, because it has a softer surface than common fascia rollers. Regular fascia training with the Taurus fascia / massage roller Basic supports the regeneration of muscles and can long-term counteract tension. 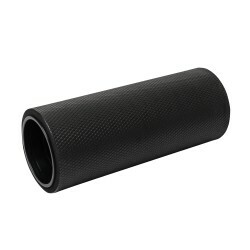 The fascia - a supporting and connective tissue in the whole body - are massaged and loosened while exercising with the Taurus fascia / massage roller Basic. The fascia roller is also ideal for balance and core training and supports the holistic fitness concept. Either strength or stamina training: fascia training should finish every training for optimal training results and more well-being.